Resembling a cross between broccoli and cauliflower, Romanesco is a compact head of beautiful lime green florets attached to a cluster of stalks. These florets form a pyramid of spiraling, pointed cones, resembling a small alien Christmas tree. It is sweet with a mild nutty flavor without the mild pungency of cauliflower. 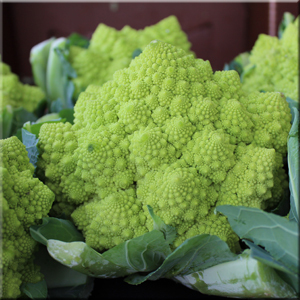 To begin, you can use Romanesco in the same manner as broccoli or cauliflower-cut into florets and blanched or steamed, roasted or sauteed, dressed with good olive oil or brown butter and crispy shallots and presented on its own ,or with mixed vegetables. It can also be left whole, halved or quartered for more dramatic presentation. Romanesco is excellent as a principle ingredient with fresh pasta or as a vegetable in fritto misto. Striking in appearance, broccoli Romanesco is actually an heirloom cauliflower, native to the Mediterranean coast roughly in the region from Rome to Naples. Romanesco has grown in popularity in California in recent years, due to increased planting, primarily by organic farmers. It has generally been available from late September through the winter months.